In case you missed it (because, you know, there was an actual game going on), there was an impressive collection of technology that supported and powered Super Bowl LII at U.S. Bank Stadium in Minneapolis, Minnesota. This included a high-density Wi-Fi solution to keep fans connected in-stadium, and in general create an outstanding mobile experience during the entire event. The results of which were impressive, as this year’s Super Bowl was the most engaged Super Bowl to-date with 16.21 TBs of data transferred across the Wi-Fi network by fans, from Super Bowl pre-game festivities until the conclusion of the event. Of this total number, 2.6TBs of social data was transferred across Wi-Fi at Super Bowl LII, an increase from the 2TBs of data the year before. It may seem like a relatively small percentage compared to the total number, but when you consider 1TB of data is approximately equal to the streaming of over 400 HD Netflix movies, 2.6TBs is substantial. And while the number itself is compelling and underscores the breadth of social engagement we see among sports fans (or people in general), it’s equally interesting to understand how individual social platforms performed and responded during the course of the game. 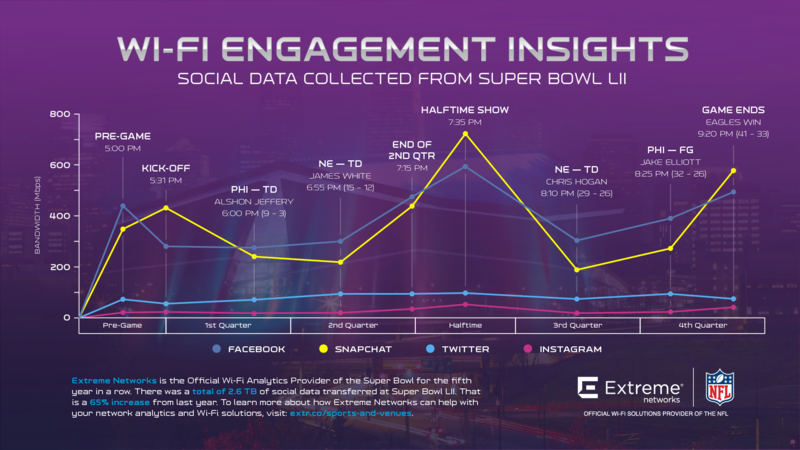 As the Official Wi-Fi Analytics Provider of Super Bowl LII, Extreme Networks measured the Wi-Fi performance and key engagements from connected fans at the Super Bowl, and examined how usage across top social applications changed as the game went on. Below are two graphics that display these results, highlighting how fans usage Twitter, Snapchat, Facebook, and Instagram at the Big Game. Check it out! 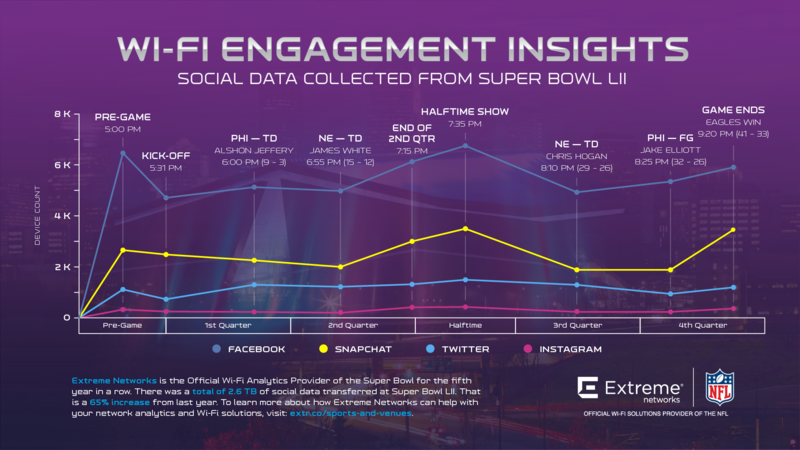 As stated above, the two graphs depict social media usage across key applications throughout the Super Bowl game itself. One graph measures the actual number of fans using the application (figure 1) at a given time, the other is the amount of bandwidth those applications consumed. Most importantly, we identify what is occurring on the field during the game to understand why the network (and the social apps) are reacting the way they are. At a macro level the two charts shed light on the sheer popularity of the four social platforms, at least as they apply to a live sports event. Facebook was clearly the preferred social app of the Super Bowl in terms of usage numbers alone, with SnapChat, Twitter, and Instagram following suite, respectively. With that in mind, in Figure 2 we see the amount of bandwidth SnapChat generated is equal and at times surpasses the amount bandwidth generated by Facebook. It’s a dynamic we’ve observed before. SnapChat is an app that emphasizes recording and sharing videos, an activity that consumes more bandwidth over Wi-Fi, versus Facebook users that typically post images (despite Facebook’s attempts to gain momentum with their Facebook Live and Facebook Story features). The charts also demonstrate the key moments where the network engagement was the most active. The Super Bowl Halftime Show continues to be the most popular time for Wi-Fi engagement. Whether fans are less focused on the game or they’re documenting Justin Timberlake on stage (or both), social media apps over Wi-Fi peaked in terms of both usage and bandwidth. For more Super Bowl and NFL insights, visit our Sports and Public Venues solution page!